As human beings, we have the capacity to dream, imagine,calculate, ponder, and speculate about the future. We differ in this way from other created beings. One won’t find a gathering of animals talking about how to build a better society, plotting to take over another jungle, or even gathered in groups worshiping an important member of their herd. Something unique was built in to us which allows us to be lifted from the task of survival to another world - the realm of Spirit - the Kingdom. Other religions have their beliefs about how one enters the spiritual realms whether in this life or the next because all humans have this sense of the supernatural and a level of faith. We all know there is something else. We aren’t just animals eating and reproducing in the circle of life. All the religions of the world require men or women to do something to make themselves more pure or to prove their dedication or spiritual prowess the purpose of which is to elevate them or assure them of some afterlife betterment or heavenly reward. Great effort and dedication is required to attain these spiritual goodies, and systems of judgement and examination are installed by the respective leaders and groups to see who will or will not receive them. In TRUE Christianity, however, all this is turned upside down. Instead of us doing something to experience God or the afterlife, HE - God - does something for us! For us, there is NO EFFORT REQUIRED! In my herd (Church), a year ago, I was worshipping God. The band was playing “Lion and the Lamb” by Bethel Music, and I had my eyes closed and hands raised. I couldn’t sing at that moment because of the painful lump in my throat and tears in my eyes. I was overwhelmed by the goodness of God and all He has done for me - us - humanity. He (JESUS - God incarnate) had stepped out of his spiritual realms ("the heavens" in human terms) with power, authority, confidence, and joy, and he made a sacrifice that made us righteous before God! I could see him as I listened to those words “Our God is the Lion - the Lion of Judah! He’s roaring with power and fighting our battles - and every knee will bow before Him. Our God is the Lamb, the Lamb that was slain, for the sins of the world. His blood brakes the chains - and every knee will bow before the Lion and the lamb!” I could see him coming with power and authority. There was delight in his eye, he had a Lion by the mane, and he was tenderly carrying a baby lamb. 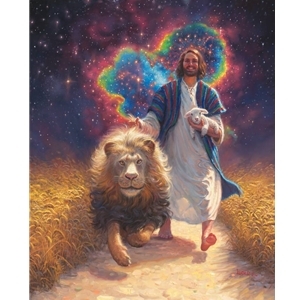 Behind him radiated heavenly light in the color spectrum of a rainbow, and he was coming - yes, in a hurry - coming for me! He wasn't coming with an angry look that one would see if you’d done something wrong but with the look of the bridegroom coming for his bride - HE WAS IN LOVE! Even as I write this and remember it, the vision brings tears to my eyes. We SO WANT TO BE LOVED! When it happens and we experience it, we don’t feel we deserve it. There is a level of fear and pain. I guess that is religion speaking to me saying, “You better do something to deserve this.” Yet, here He comes with that confident smile. There is nothing left for me to do but enjoy Him.